The endocytoscopic system (ECS) helps in virtual realization of histology and can aid in confirming histological diagnosis in vivo. We propose replacing biopsy-based histology for esophageal squamous cell carcinoma (ESCC) by using the ECS. We applied deep-learning artificial intelligence (AI) to analyse ECS images of the esophagus to determine whether AI can support endoscopists for the replacement of biopsy-based histology. A convolutional neural network-based AI was constructed based on GoogLeNet and trained using 4715 ECS images of the esophagus (1141 malignant and 3574 non-malignant images). To evaluate the diagnostic accuracy of the AI, an independent test set of 1520 ECS images, collected from 55 consecutive patients (27 ESCCs and 28 benign esophageal lesions) were examined. On the basis of the receiver-operating characteristic curve analysis, the areas under the curve of the total images, higher magnification pictures, and lower magnification pictures were 0.85, 0.90, and 0.72, respectively. The AI correctly diagnosed 25 of the 27 ESCC cases, with an overall sensitivity of 92.6%. Twenty-five of the 28 non-cancerous lesions were diagnosed as non-malignant, with a specificity of 89.3% and an overall accuracy of 90.9%. Two cases of malignant lesions, misdiagnosed as non-malignant by the AI, were correctly diagnosed as malignant by the endoscopist. 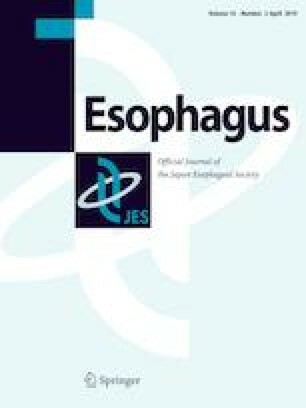 Among the 3 cases of non-cancerous lesions diagnosed as malignant by the AI, 2 were of radiation-related esophagitis and one was of gastroesophageal reflux disease. AI is expected to support endoscopists in diagnosing ESCC based on ECS images without biopsy-based histological reference. We are grateful to Tomoyuki Kawada for his kind advice and confirmation of statistical analysis. T. Tada, Y. Endo and K. Aoyama are employed by AI Medical Service Inc. The other authors declare no conflict of interest. All procedures followed were in accordance with the ethical standards of our hospital ethics committee on human experimentation and with the Helsinki Declaration of 1964 and later versions. Written informed consent for endocytoscopic observation was obtained from all patients. Opt out consent was obtained for AI analysis.